Many dancers may be concerned at the possibility of developing unsightly and painful bunions on their toes as a result of dance. Whether this be as a direct result of pointe work, heeled shoes or even with dynamic foot control dancing barefoot. Although this is a valid concern, and can be true in some situations, it doesn’t need to be the case. A bunion (Hallux Valgus) develops around the big toe joint and can ultimately be quite painful and restrictive with movement. It is a mal-alignment of the big toe joint, when the end part of the big toe begins to angle in towards the other toes, and the base of the toe (first metatarsal) drifts away from the second metatarsal. Extra bony growth (osteophyte lipping ) around the 1st toe joint can also be referred to as a bunion and can be equally painful. A bunion is normally a result of altered lower limb mechanics and control. This means that the leg doesn’t move very efficiently when walking or dancing. Over time the 1st toe joint is subjected to more stress than it is supposed to take and this leads it to become irritated and sore. This repeated irritation leads to new bony growth around the joint to make it stronger and resist more loading. However, it becomes very painful and further restricts normal movement of the toe. The cause of this irritation is often due to poor movement control higher up in the hip and pelvic region. Good hip, pelvic and core control is essential for strong and efficient leg and foot control when dancing. Over turning out from the knee, with poor turnout control in the hips, can lead the feet to over pronate in 1st and 5th position and irritate the 1st the joint. This is also the case with repeated landing in jumps and leaps with weak hip control from above. Pain is normally the first indication that we have a problem in this area. Pain is felt along the joint line of the 1st toe. It may even be tender to touch and can sometimes look red and inflammed. It will also be very painful in a demi pointe position and can lead the dancer to sickle the foot to avoid full toe extension and pain into the toe joint. This is the case whether dancing barefoot/ballet shoes or being forced into demi pointe in a heeled shoe. The toes no longer look straight due to the drift inwards and it can be problematic fitting shoes, both for dance and normal street wear. Diagnosis can almost be made by the individual. Assessment of why it has occurred however will need to be done by a trained physio/ clinician. Pinpointing the primary cause of the movement dysfunction is of paramount importance for treatment and corrective rehab. The earlier you start rehab the better! Taping to help to correct the toe alignment and offload the joint. Many people use toe separators, and this may help prevent the big toe from crossing the second toe, however it does not solve the real problem. It is preferable to tape under the head of the first metatarsal, draw the tape up and over the knuckle and de-rotate the first metatarsal. The tape is then wrapped around the big toe. A tape can also be used to keep the head of the first metatarsal in closer to the second and reduce sideways drift. Awareness of foot placement, ‘tripod’ positioning with even weight over 3 points of the foot. Supportive foot wear with correct width and arch support if required. Avoid wearing heels too often! Mild padding (foam doughnut) may ease pressure if placed over the bunion in a dance shoe. Corrective exercise for the leg and pelvis to ensure correct alignment and stability for the lower limb. In very severe cases, the toe can be operated upon and straightened and pinned in place. The toe however is now very immobile so a lot of function is lost leading to problems further up into the body in the hip, knee and spine. Over time with guided treatment and help with taping, there may be some degree of correction in alignment of the toe; however any extra bony growth will remain. The main aim of treatment through guided rehab with the appropriate exercises is to prevent it worsening and minimise the frequency of ‘flare ups’. Will my dance shoes cause my bunion? Just as continuous use of ill-fitting street shoes can cause damage to the toes, it is feasible that ill-fitting dance shoes will lead to the same outcome. However, if shoes are fitted well and the width is correct with good support there shouldn’t be a problem. If dancing frequently in heels however, be mindful to wear flat shoes and allow the feet to move normally when off stage. 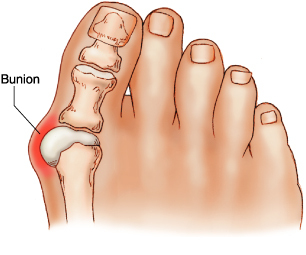 Bunions can be avoided with strong feet, hips and core. It is very important to have well fitting dance shoes. A professional fitting is required for a pair of pointe shoes. Alternate foot wear from heels to flats. Have bare feet to allow the feet to strengthen also. Previous Post THE METHODOLOGY OF TEACHING!